Like most kids, I lived for sweet treats. Not so much anymore, but I still like to throw it back sometimes and relive my childhood. A perfect evening back in the day was a bike ride at dusk with my older brother. We’d both get a dollar from my mom — I would tuck mine safely in my Strawberry Shortcake white wicker bike basket and we’d head off into the just starting to cool off night. We’d “pick up” our neighbourhood friends along the way to the corner store, ringing our bells and barely pausing for them to catch up. Our crew of skinned knees and sunburnt shoulders would spend a good fifteen minutes pressing our noses against the cold glass of the ice cream case. We’d always end up picking the same treats, but back then, having a choice made me feel older than my six-year-old self. Inevitably, I would pick out a classic ice cream sandwich. It was no contest: the Revellos, Fudgsicles and Creamsicles were nothing compared to biting into the dark brown cake-like cookie and creamy vanilla scented ice cream. To be honest, I haven’t had a classic ice cream sandwich in ages — I’m worried that they won’t live up to my memories — but I have no trouble indulging in ice cream sandwiches with a twist. A while ago I had a maple bacon ice cream sandwich at Meat & Bread in Vancouver. I really love sweet and salty desserts so it was no surprise that I fell in love a little bit. I haven’t tried my hand at making ice cream sandwiches before, but while perusing the local grocery store (one of my favourite things to do on vacation) in San Sebastian, Spain, I saw perfectly sized ice cream sandwich wafers. I was so excited I literally squeaked. Mike: Ok, don’t freak out, but I see something that you might like. Me: Look!! Ice cream wafers!! Mike: Yes, but look into the freezer next to the ice cream wafers. There was ice cream, of course, in perfect ice cream sandwich prism form! Ice cream sandwich making is serious business here in Spain. I absoluetly had to buy some sandwich making materials and these brown sugar bacon ice cream sandwiches are the result. 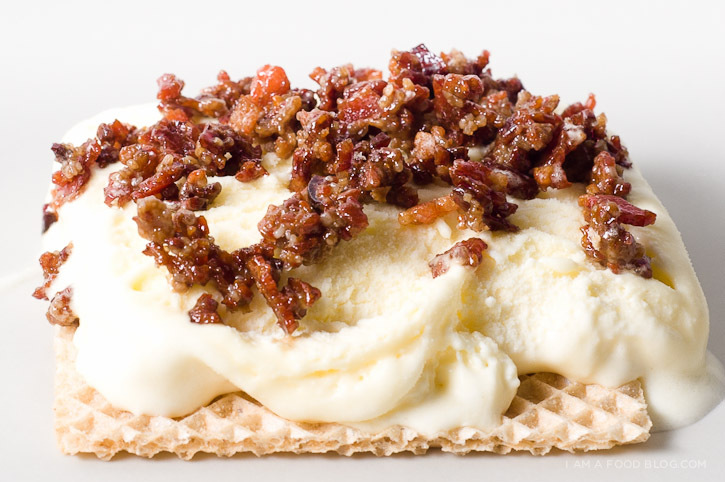 Salty, sweet, crunchy candied bacon bits with creamy vanilla ice cream and crisp wafers…these sandwiches are definitely a hit. The bacon bits on their own are so good that I had to stop myself from devouring them. 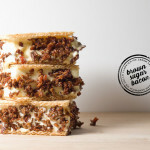 Even if you’re not into ice cream sandwiches, do yourself a favour and make these bacon bits! Sprinkle them on anything, or if you want, have them as a snack with a spoon — I won’t tell. PS – You can follow my travel adventures on Instagram: @iamafoodblog. 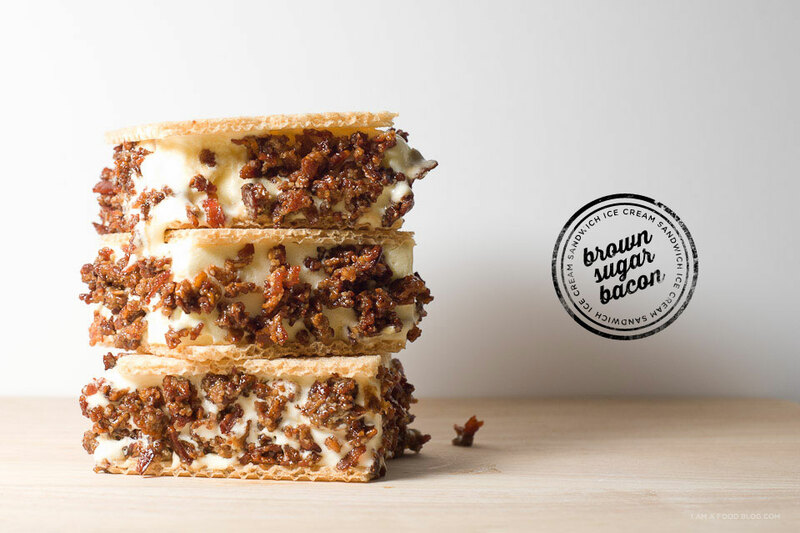 i am bacon, i am brown-sugared: i am brown sugar bacon ice cream sandwich! Heat up a small non-stick skillet over low heat. Add the bacon and stir occasionally, rending out most of the fat. After about 15 minutes the tiny bacon bits should be super crispy and deep brown. If they aren’t, continue to brown until crispy. Remove the bits from the pan with a slotted spoon and drain on paper towels. 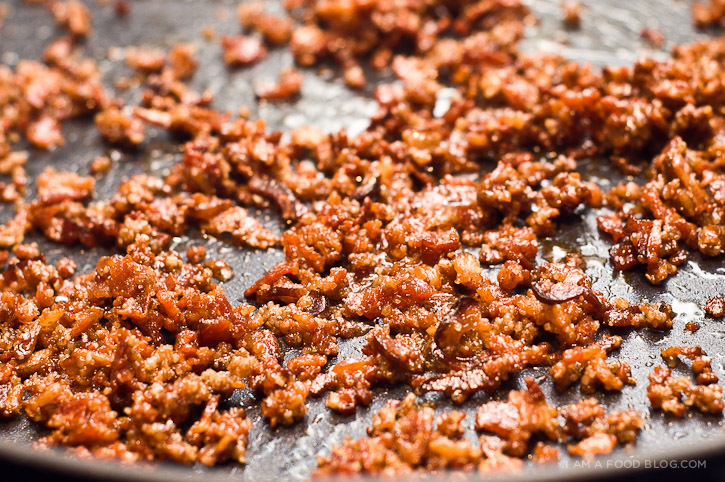 Save the bacon fat for other uses if you wish, but either way, clean out your skillet. Heat up the clean skillet on medium-low heat and add the bacon and sugar. Stir to coat. The sugar will start to caramelize. Keep a close eye on it as sugar burns fast! As soon as the sugar crystals dissolve and the bacon is coated in caramel, remove the pan from the heat and let cool. **You may be tempted to cook your bacon over higher heat. Feel free to but keep an eye on it. I like cooking it a low heat because I find it renders out more fat and results in crispier bacon. It takes time, yes, but it’s worth it. Once your bacon bits are cool, it’s time to assemble. 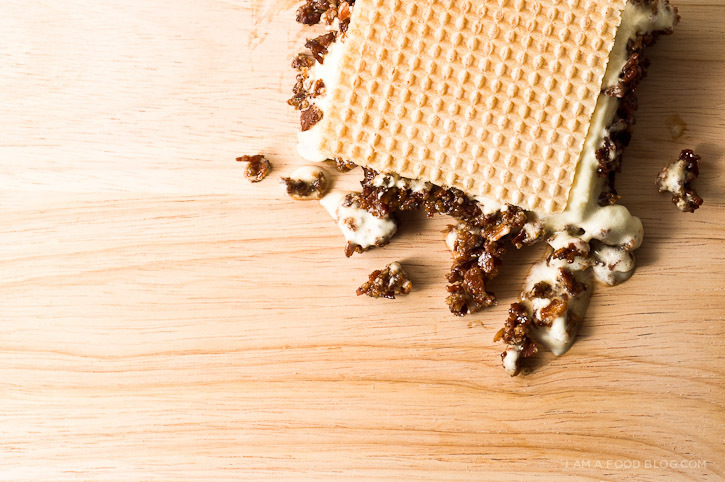 Make sure you have everything ready to go: your wafers or cookies, your ice cream, a small ice cream scoop and your bacon bits. 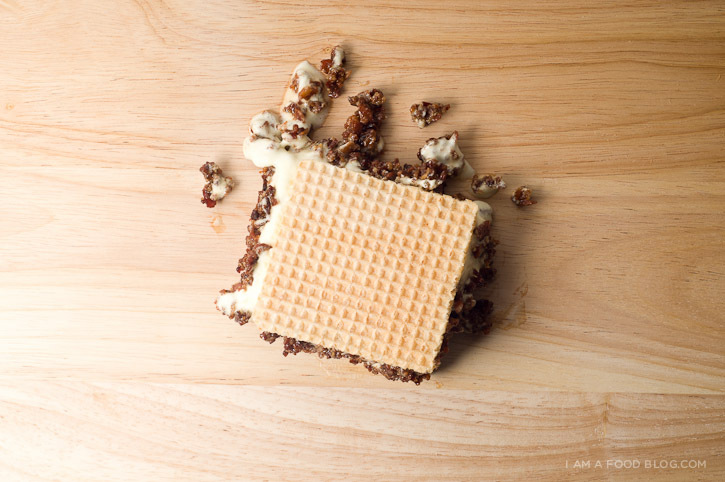 Place a small scoop of ice cream on a wafer or cookie, top with the another wafer or cookie and press down gently. Roll the sides in the bacon bits and freeze immediately for at least 4 hours. Repeat as needed. It’s hard to wait, but it’s worth it! Wrapped, the sandwiches should keep for up to 7 days in the freezer. Jealous! I can’t believe they have cubes of ice cream for sandwiches! These look freaking amazing. This looks simply delicious. Thanks for sharing this wonderful recipe. 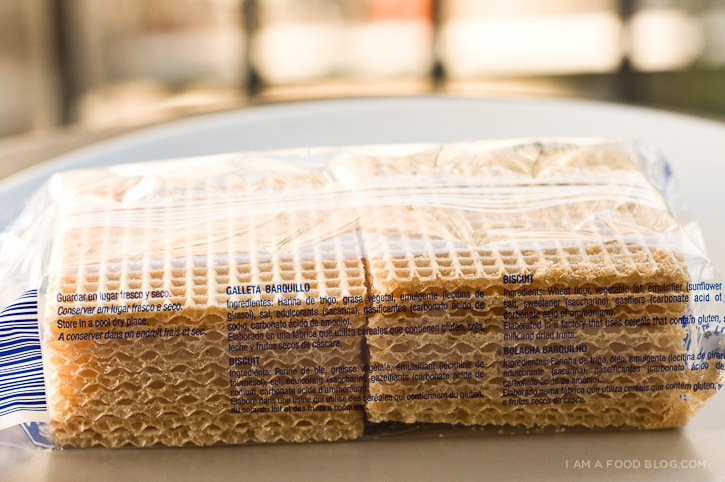 Wafers are such a great choice for sandwiching! I can usually find gluten-free wafers, so thanks for the idea! Are you kidding me?? AMAZING!!! Yummy!Unique sandwiching for the wafer,I don’t really thinks its possible. Simply cool and delicious. This is TROUBLE. Double TROUBLE. This looks amazing! I love the blog and had to link up to this recipe on mine today :) Thanks!! This is disgusting. I feel nauseous looking at it. I would feel like crap for a month after eating something like this. I loved that you chopped the bacon so finely. That’ll ensure even distribution so you’ll have a little bacon in every bite. Looks delicious. I can’ wait to try these, they look amazing! where did you buy the wafer??? ?